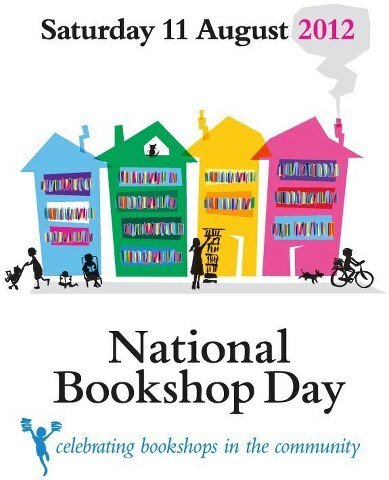 Today around the nation, bookshops are celebrating National Bookshop Day. 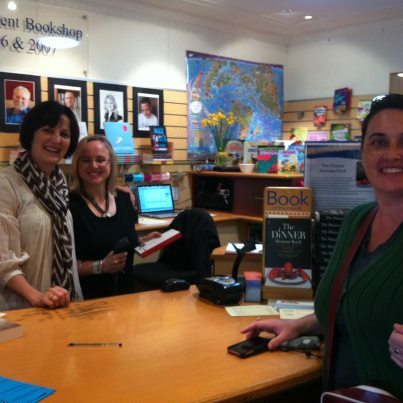 This day recognises authors and their books, and the bookstores that support them. Take a look around you at your local bookshop and take the time to say hello and well done! Today I’m featuring another wonderful independent bookshop – Riverbend Books and Teahouse. Riverbend Books is on the corner of Oxford and Cambridge Streets. The literary allusions that came along with the address were welcome but the name Riverbend harkens back to the early days in Bulimba when Indigenous Australians called the area Tugulawah, which translates as Riverbend. And that is exactly what the river does in Bulimba. It takes a 90 degree right hand turn as it winds its way out to Moreton Bay, and the river itself forms two of the boundaries of this suburb. Older residents of Bulimba refer to their suburb as the Island because of its watery boundaries. There is a sense of community that is engendered because people do not travel through Bulimba on their way to somewhere else, Bulimba is always the destination. 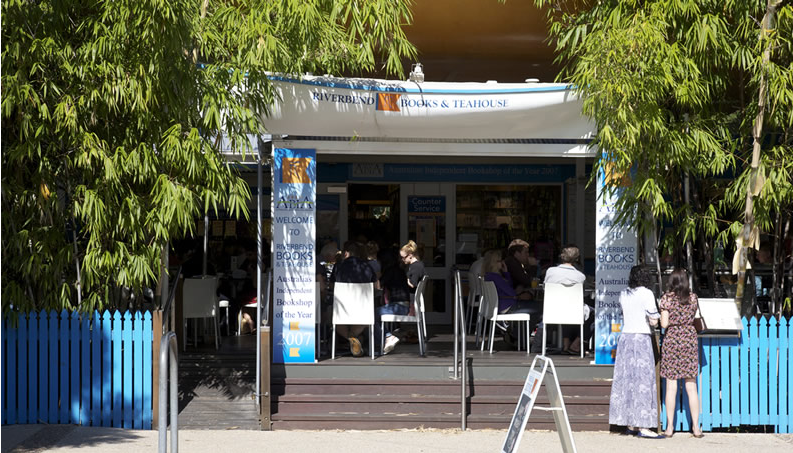 Riverbend is proud to be part of this community and one of the stores that takes its place amongst the many stores, cafes, cinemas and the beautiful Oxford Memorial Park that line the Oxford St strip down to the river. Many of our customers love to travel here by City Cat or ferry and wander up the street to visit us. The ambience of the shop is warm and friendly with a beautiful deck out the front where you can enjoy some lovely light, fresh meals and of course great coffee or a glass of some lovely Australian wines. In the thirteen years since we have opened we have very much enjoyed being part of the local community. Our raison d’etre has always been to encourage a culture of reading in the local and wider community, and we run an extensive program of author events, workshops, host bookclubs and then there are the regular bookchats that our staff give to a wide variety of groups from Teacher librarian network groups, social groups, work colleagues and bookclubs. Recognition by our peers in the publishing industry has provided us with some highlights along the way. Riverbend has won Queensland Independent Bookshop of the Year 6 times and Australian Independent Bookshop of the Year twice. Tomorrow the intrepid Helene Young comes to visit – romantic suspense author and aviator extraodinaire! Riverbend Books and Teahouse is located at 193 Oxford Street, Bulimba Queensland 4171 (on the corner with Cambridge Street). 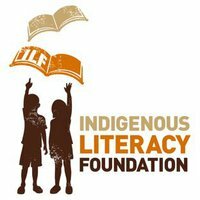 This entry was posted in Books, Writing and tagged Bookselling, Fred Hollows Foundation, Helene Young, Independent Bookshops, National Bookshop Day, Riverbend Books by jenniferscoullar. Bookmark the permalink. This is how book shops used to be and hopefully will be again in the future. The era of the book barn is dead, long live the bookshop!